On January 22, 1905 Paul L. "Pinkie" George was born. Quite wrongly the credit for the National Wrestling Alliance (group) goes to Sam Muchnick. While Muchnick was a great mind for the business and took the Alliance to heights George never dreamed of, nor wanted, the original concept had been the idea of one man, Pinkie George. With three others seeing the immediate benefits and adding to it, Tony Stecher, Max Clayton, and Orville Brown. Those four promoters would align early on in the 1940s to share talent among themselves in a way to combat the larger promotional operations. - Tony Stecher was the older brother, former manager and training partner of one time famed World Heavyweight Champion, Joe Stecher. He was promoting out Minneapolis, Minnesota. - Orville Brown was a big drawing wrestler in the Midwest area as well as the promoter out of Kansas City. He would go on to be the first National Wrestling Alliance (group) World Heavyweight Champion. - Max Clayton was a well respected promoter out of Omaha, Nebraska. The name of the National Wrestling Alliance was actually taken by George from Billy Sandow (William Bauman) and his brother Maxwell. As the 1940s rolled around on the calendar the North American professional wrestling scene was heavily divided to say the very least. There were several major promotions across the continent with most, if not all of them being represented by their own hand-picked World Heavyweight Champion. Plus many other smaller operations in cities and their surrounding areas. 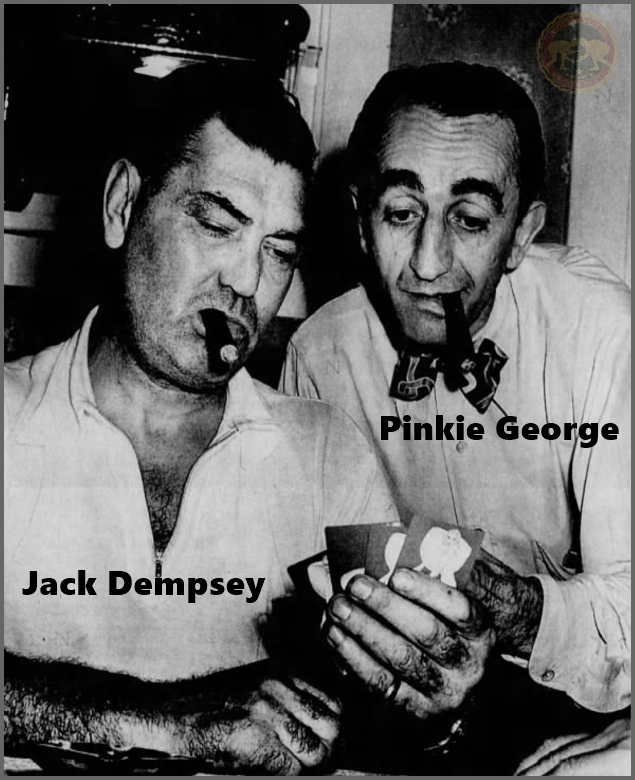 Pinkie George was promoting out of Des Moines, Iowa sometime in the 1930s (possibly as early as 1928). During the early '40s he billed the Midwest Wrestling Association World Heavyweight Champion, the Kansas City version, as his champion, while it was Orville Brown anyway. By 1943, George had ideas of his own local (world) champion. He accomplished that when Ed Virag, who was the National Wrestling Alliance (Wichita, Kansas) World Heavyweight Champion, traveled to Des Moines. The Wichita promotion was, as you've probably guessed ran by the brothers Billy and Max. As mentioned, George liked the name of the brothers' promotion so much he took it for himself. His title did not really get off the ground though, he seemingly just had continuous problems with finding the right wrestler to represent his area for the first year or so of it's existence. Finally he and Brown came together again and Brown became his long term champion. So, when the group formed on July 18, 1948, it made sense that Brown was the fist National Wrestling Alliance (group) recognized World Heavyweight Champion. The other men at the meeting were Orville Brown, Sam Muchnick, Max Clayton, and Wally Karbo on behalf of Tony Stecher. Fred Kohler agreed to the terms of the Alliance via mail. George was appointed the first President of the group. - Wally Karbo is the man who would go on to partner with Verne Gagne in the American Wrestling Association. - Sam Muchnick was a former journalist, the promoter of the St. Louis Wrestling Club and future long term President of the Alliance. - Fred Kohler was the promoter whom had the famed television deal with the DuMont Network during the 1940s and '50s. It's quite possible George had actually got the idea of the Alliance from Jack Curley whom he had the chance to get to know during the 1930s, along with his brother Andy George, who helped promote the Iowa territory. Curley was referred to by the press during his heyday as the "Czar of Wrestling" due to the trusts he formed with promoters all over the continent and even working relationships as far away as Europe. - The Alliance was to be run as a democratic process. - Each member had a vote on all matters and all votes were equal. - The President did not receive a vote as he was there purely to oversee. On the occasion of a tied vote, then and only then could the President vote. - A wrestler was to be booked out of the original office that he stated with. - The concept was for big operations and small operations to co-operate and help each other. In George's mind the concept was perfect for the Midwest communities, which for the most part had already been sharing talent. He felt that one World Champion touring between the territories would be better. It also meant wrestlers in general could freely move about without worry of backlash and if one promoter was struggling, the others could send over talent or whatever was needed to help them get business back up to where it needed to be again. "I have worked day and night on this and spent a lot of money out of my pocket. I hope I have not done so in vain. I have the least to gain because if it works or not I am still a small town promoter---which of course I can't help. I do know this however, when I first started this everyone laughed at me---no one wanted the presidency but with hard work, a dream and idea, I held them together and now many new members are coming in every day." Indeed it did grow and the membership list grew far quicker than George ever envisioned. It turned out a lot of promoters all over the United States realized what a beneficial arrangement the NWA could be and how promising it sounded. The size of the Alliance got to the point where George felt it was time to step down as the President, he remained a member, but, he did not think of himself as the right person to spearhead the Alliance. "Frankly the only reason I have been president is because the Alliance was my idea. In September my term ends and Sam Muchnick will be elected as I think he is the fellow deserving of it." "The U.S. is big enough for all of us to make money, but I think MORE can be made with proper co-operation." By 1951 things had started to go sour between George and the Alliance, or more specifically Sam Muchnick. While George had initially been very graceful in Muchnick being his replacement at the helm of the Alliance, it didn't take long for George to start seeing what he thought were plots to push him further out of the inner-circle of the Alliance, with Muchnick orchestrating the whole scheme. "I know that today I am a small wheel -- funny, but I like it that way because I know it has progressed beyond my idea. That's good. BUT, THE WHOLE CONCEPT IS BUILT AROUND THE FACT THAT THE BIG GUYS ARE TO HELP AND NOT HAMPER THE LITTLE ONES." The situation just continued to deteriorate throughout the 1950s. The Alliance faced a lawsuit which George felt Muchnick tried to bury him in. He also thought that Muchnick had the agenda of eliminating all of the founding members of the Alliance. Worst of all, he felt Muchnick was using the Alliance to make himself and a few friends rich, while neglecting everyone else under the umbrella, and anyone they did not want to let in for whatever reason. Tim Hornbaker wrote a fantastic book called the National Wrestling Alliance: The Untold Story of the Monopoly That Strangled Professional Wrestling, that goes much more into detail on the workings of the National Wrestling Alliance and the various legal threats they faced. As well as the issues between George and Muchnick. The first - "A very small minority of the Alliance including President Muchnick are in violation of the Government decree. Interlocking regional monopolies that control the champion endanger every member in the Alliance. (better read the consent decree you signed)"
The second - "The president [Sam Muchnick] uses Alliance money to send out circulars and destroy anyone that does not agree with him. Remember Martin Thesz, later, Lou Thesz, and others? Now it's me." Not long after leaving the Alliance, he stopped promoting professional wrestling all together. He continued promoting other sports though in his local Des Moine, Iowa area. Unfortunately because of the way things ended for him in the wrestling world his name is pretty obscured in the history books. He deserves to be remembered for laying down the foundations for what ultimately became the most recognizable three letters in the professional wrestling industry for many, many years, N - W - A. Biography of Paul L. "Pinkie" George.